Starts my Kawasaki ER-5 first time even in the coldest of mornings so far......Good product and fits the battery compartment perfectly. Fitted to my 2007 Yamaha fz1n. The original battery has started to fail. Let's hope the new battery last as well. I ordered my battery online and within 24 hrs. it was delivered and fitted onto my bike. Price was cheaper than my local battery dealer and it was free postage. Excellent service would highly recommend this company to anyone. Super Fast delivery Nice price All good!! 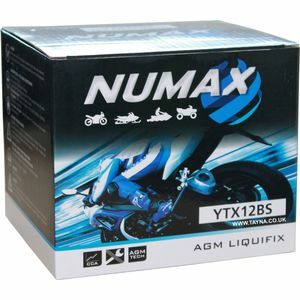 Ordered a Numax YTX12_BS battery to replace current failing unit. It's a Liquifil or fresh-pack battery. This means that they are filled by the customer rather than in the factory, this means that the battery is not activated until you fill it. Advice from Tayna was fill the battery, allow to stand for a an hour or two. During this time the acid will be absorbed in to the glass matting in the battery, and your battery will then become the AGM/GEL type. Followed their instructions, swapped it in . Early days but bike has started first time without issue since - 4/5 star service so far from Tayna team, need to see how well the battery functions for final score. However delivery took 48hours from order at 11:00 07/03 arrived 14:09 09/03 so wouldn't rely on advertised overnight delivery. Prompt delivery during bad weather. Acid filling was a bit awkward but after charge battery works fine. Excellent service and a good price. Helpful on phone and quick delivery. Very efficient service. Web site easy to use, prices competitive and quick delivery. Only loses a star as product packaging is messy to deal with and not environmentally friendly. Some sort of recycled cardboard packaging would be better rather than expanded polystyrene foam. Saying that, perhaps Tayna uses the same packaging as they receive from the supplier, therefore passing it on to the end user. Seems OK packaging and filling instructions good. Longer term test needed. so far absolutely no complaint well constructed easy to fit, easy to fill with acid.. so no complaints, I hold my fingers crossed that it will last two plus years. my original bike battery Yuassa? lasted 5 years so fingers crossed. I have a optimiser fitted to it as my bike has systems that will drain the battery when sat alone. Better spec and lower price than Halfords. Fast delivery too. What's not to like! Good product, and excellent delivery. Was able to track it all the way.